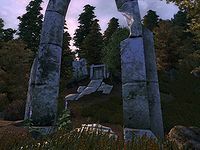 Hrotanda Vale is a medium-sized Ayleid ruin north of Chorrol containing bandits. It contains two zones: Hrotanda Vale and Hrotanda Vale Sanctum. You have a 10% chance of meeting an Orc Adventurer here. 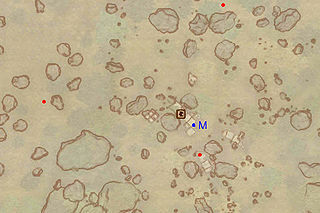 This location's map marker (M on map) is named Hrotanda Vale (editor name HrotandaValeMapMarker). The entrance door is NW of the marker, 20 feet away. Immediately after entering, you will arrive at a three-way junction. Heading straight would lead you to door C, but the gate at G, which is opened by pressing the push-block (cyan dot on map) on the other side, prevents you from reaching it. Heading either left or right will lead you to the next room. 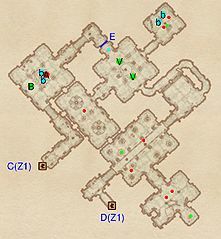 When there, be mindful of the Ceiling Spike Trap (E) and Spike Pit Trap (F) which are one after the other. In small room to the right you will find two bedrolls (b). 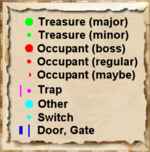 In the next room, claim the six Welkynd Stones from their pedestals, then proceed forward through the 'U'-shaped corridor for a 10% chance of meeting an Orc Adventurer (O). In the next room are another bedroll (b) and a Bonemeal portion in a bowl. In the last room, stepping on the pressure plate in front of the Hidden Door at H will reveal up to two Ethereal Undead enemies and a Boss chest (B). Exit to Hrotanda Vale Sanctum through door D.
You will enter this zone from the first one through door D and can fast-track back to it by using door C.
In the first room, take the seven Welkynd Stones and examine the southeastern room for three additional stones, one of which is hidden in a corner. In the third large room you enter, you will find two easily-reachable Varla Stones (V). Here you will be at a three-way intersection: the room to the left contains nothing more than an enemy, while the one on the right has two. If you're lucky, they might be sleeping in the two bedrolls (b) nearby. The gate at E is opened by standing on the pressure plate in front of it (cyan dot on map). 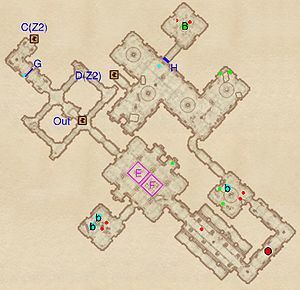 The last room contains the Boss-level Bandit (A), this zone's Boss chest (B), two bedrolls (b) and another portion of Bonemeal, also in a bowl. This page was last modified on 25 March 2018, at 02:56.